Morgan County was formed in 1807 and was named in honor of Daniel Morgan who served as a General in the Revolutionary War. Similar to other counties in the area, Morgan found itself at the edge of the Indian frontier early in its history and that led to some problems. In 1813, Creek Indians massacred several residents of the county. The state of Georgia would send in infantry to help the frontiersmen and there would be no more attacks by the “hostiles.” The city of Madison would be incorporated as the county seat in 1809 and named in honor of America ’s fourth president, James Madison. The town would grow quickly and had upwards of 13,000 residents within a decade or so. The city was also a stop on the Seven Islands Stage Road—the same road we discussed in our earlier Jasper County column. As I mentioned then, this was known as one of the oldest roads in America and was the main route that linked Charleston all the way to New Orleans . The town also had the good fortune of being located in a very fertile section of the Georgia Piedmont, making it ideal for growing cotton. All of these factors combined to make Madison a successful city that would see growth and prosperity throughout most of its history. Every time I drive out to Madison , I am truly amazed at how beautiful of a town it really is. One of my favorite drives is to take Hwy 278 from Covington all the way to Madison . As you enter the historic part of Madison , you’ll run into the main drag—Hwy 441. Swing a left and you will feel as if you’ve stepped back in time with all of the antebellum houses on either side of the road. Turn off on any of the side streets, and you’ll see many more beautiful homes. As you near the square, you’ll notice something a little different. In the middle of the square, there isn’t a courthouse or a park like most southern cites—there’s a U.S. Post Office. Madison sold that land to the Federal Government in 1914 for $5,000. 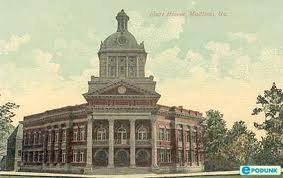 On the southeast corner of the square is where you will find the Morgan County Courthouse. As many of you know who’ve read some of my previous columns—I’m a sucker for Georgia courthouses. And folks, I must say (and with apologies to my hometown of Covington , GA ), I believe that Madison has the best one in Georgia . Built in 1905 with a neoclassic architectural style, it is absolutely wonderful. One of the most interesting aspects of Madison ’s history occurred during the Civil War. The fact that Madison was smack dab in the middle of Sherman ’s March to the Sea would make someone wonder about all of the antebellum structures that survived. The key to that would be one man—Joshua Hill. Prior to the War Between the States, Mr. Hill was a lawyer and served as a U.S. Senator. He opposed secession but when the war started up, he resigned and moved back to Madison . While in Washington , Hill had struck up a friendship with William Tecumseh Sherman’s brother, John. As the years went by and the war started to take its final direction, Hill’s son was killed in action in north Georgia in 1864. Hill got in touch with William Sherman so his son’s body could be sent back to Madison for burial. During this time, the two met and discussed many things including a desire to see the war end. It is believed that it was at this meeting where Hill asked Sherman to spare his beautiful hometown. In November of 1864, as Sherman and his forces reached Madison , they proceeded to tear up the railroad tracks and burn the train depot, cotton gins, and a few commercial properties but spared the houses of the town. However, as fate would ironically have it, the plantation house and buildings of Mr. Hill’s estate were burned to the ground. It was thought that this was done as revenge by the Yankee soldiers because they weren’t able to pillage and plunder the city itself. Not too surprising considering how ruthless they were in Georgia . But thanks to Mr. Hill, most of the beautiful city of Madison was spared. As I mentioned in a previous column, many folks refer to Covington as “C-town.” A friend of mine from Conyers once tried to tell me that Conyers is the original “C-town.” Well...for one thing, Covington is older, and with apologies to anybody who feels otherwise—Covington is the original C-town. Growing up in Covington during the 1980's was pretty cool. Buying G.I. Joe figures at Harper's, getting baseball cards at Leo's, and enjoying vanilla malts at City Pharmacy...it was a good time. The world seemed pretty small and Atlanta seemed like a million miles away. I imagine there are more than a few locals over the age of 40 or 50 who are probably getting a kick out me romantically reminiscing about Covington in the 80's. I'm sure they could tell you how it was in the 50's or 60's or earlier. And I'm sure it was great. 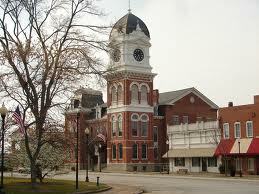 The city of Covington is the county seat of Newton County. For centuries, the Creek Indian nation had ownership of this area. Newton Co. would be made up of land ceded from the Creeks in 1805, 1818 and the treaty of Indian Springs in 1821. On December 24th, 1821—Newton Co. was formed through an act of the Georgia Legislature. The county was named for Revolutionary “war hero” John Newton. Questions actually exist as to whether or not Mr. Newton was real...his legend seems to come from the writings of M.L. 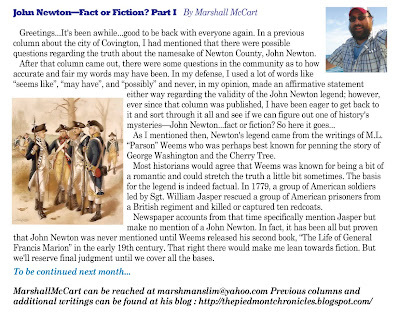 Weems who was responsible for a lot of the romantic and fabricated tales of the early times of American history including the story of George Washington and the Cherry Tree. If Newton did indeed exist, it seems likely that he was not responsible for the act of heroism that he is credited with and there seems to be evidence that he was considered by some at the the time to be of questionable character and may have actually been referred to as a “thief and a villain.” So, the namesake of Newton Co. may have never existed at all or, if he did, was possibly considered a bit of a no-account. On April 15th, 1822, the Inferior court designated an area on a hill south of a swampy area by the Dried Indian Creek as the county seat and named it Newtonsborough. The story behind Dried Indian Creek goes like this—a corpse of an Indian was found on the bank of the creek and it was all dried up...it seems doubtful there was any truth to that story. Lots were laid out and sold in May of that year, and the town started to slowly grow. In December of 1822, the state legislature changed the name of the town in honor of Brig. General Leonard Covington who was killed in the War of 1812 and remembered as a hero. Unlike Newton, his legend seems to be legitimate. Covington's first direct contact with Union forces occurred in the Summer of 1864 when a cavalry division led by Kenner Garrard was instructed by William Sherman to destroy several of the railroads and bridges in and around Covington. He actually instructed Garrard to avoid any unnecessary molestation of private properties. On July 22nd, war broke out in Covington when an older resident named Presley Jones decided to take on the Yankees by himself. He did manage to kill two of them before he himself was shot and killed. Unfortunately, in order to placate their revenge, the Union forces court-martialed and executed a local man named George Daniel even though he was innocent of any crime. Despite numerous accounts to the contrary, there seems to be no evidence that Sherman knew anyone in Covington other than the sister of a man he went to West Point with. Actually, there is evidence that Sherman had given strict orders that personal homes were supposed to be off-limits. That only commercial, agricultural, and transportation-related properties were to be destroyed in addition to bridges, trains, and train tracks. Sherman and his troops would live off the land with the actual order being to “forage liberally on the country.” In fact, when Sherman had finally reached Covington himself in November of 1864, he told the Mayor that everything inside of people's houses was off-limits but everything outside was not. While the whole goal of the Georgia campaign was to make the South sick of war, it seems that more times than not, excesses seemed to occur on the flanks or well ahead or behind the main force. At times, the Union forces formed a swath 60-75 miles wide and were picking up stragglers and hangers-on all the while. The most egregious wrongs committed against locals seemed to happen more frequently on the periphery. After the Civil War, Covington had to deal with Reconstruction. Like the rest of the South, she struggled during that period, but would eventually come through it and grow and prosper. An interesting and little-known aspect of Covington's history was mentioned in my very first column. By the 1880's, Covington had become somewhat of a “wild west town” and had upwards of a dozen saloons and drinking establishments. Some of these included hotels and general stores, but several were just straight-up whiskey joints where cards could be played and various types of “entertainment” could be found. Liquor could also be bought by the bottle at general stores and druggist shops. The increasing influence of alcohol did start to cause some problems and by 1882, when a man named Will Smith killed two men after drinking and playing cards, the prohibition movement started to pick up some serious steam in Covington and Newton County. Covington would continue to thrive with the growth of the railroads and would enjoy prosperity for many years. Like every other town we've covered in these columns, the one-two punch of the boll weevil and the Depression were tough. But the town would survive and continue on a path of prosperity. During the 70's, the city would start to attract major industry and with the close proximity of I-20, the town has thrived for the last several decades. Covington is home and I love it. It's a wonderful place.